So I’ve been partially successful at making myself rest for a week. I can’t believe it’s Friday already. I started feeling sick on Sunday and Monday, but I think avoided coming down with something by just laying down and watching anime until I got sleepy, and then napped. For me, “taking time off from training” means not doing kickboxing. I always want to do grappling…it’s what makes me happy. 🙁 First I had to let my injured eye heal, which it did by Monday. Now my shins and calves and ankle is swollen and hurt, so I’m HOPING to be back next week, but that’s optimistic. I’m glad I’m not more hurt. I’m just impatient. Every day I’m not working to improve myself is wasted, I feel. And if I don’t exercise off all that ice cream, I’ll get fat! 🙁 I’m so jealous watching everybody else train…. I lifted weights with my upper body yesterday and I’m a little sore today. Yay! Well, at least I got back to teaching kids! I wore make-up for a few days so I wouldn’t scare them. Many of the kids had seen my fight and told me “Good fight” and gave me hugs. Then one kid was like, “You got beat up!” and another kid joined in, “Yeah, you got beat up!” I wanted to retort, “DID NOT!” dang, kids! ;_; So mean! haha Whatever, they’re not entirely wrong….if you just look at my face…. But even though I felt I lost, I think it was a really close fight. And just barely losing to the number 1 ranked fighter in the world? Not too bad. I think it was the best striking performance of my career. 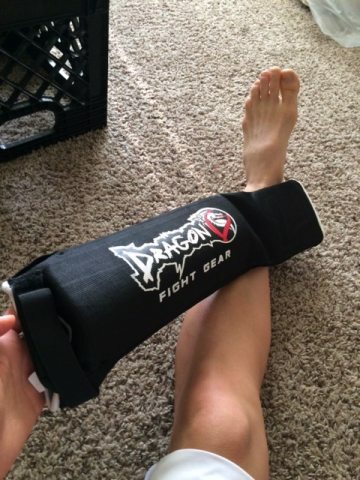 So I’m gonna see if I can do the big kid’s class and roll lightly with them with the help of my DRAGON DO SOFT SHIN GUARD! Hopefully it’ll fit under my gi pants. I’ve gotten a lot of random chores done that I’ve been procrastinating. And it’s time to start studying Japanese again. So I’ve been watching Fairy Tail. I’ve been kind of on the fence about this anime, but I’m really getting attached to Gray and Natsu. I love how Natsu is rash and a hot-head but SMART. So many of the main heroes are good people at heart but so dumb and their sidekicks are always having to look after them. 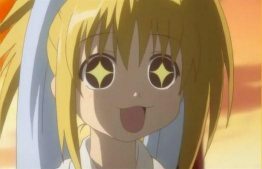 I also saw the first ep of season 2 of Lucifer. I like that series a lot!! I also watched Waterworld for the first time per John’s recommendation. Then The Huntsman!